Musical Instrument Exploration: We put out lots of kid friendly instruments: drums, maracas, jingle bells, cow bells, triangles, a xylophone, rain sticks, rhythm sticks, wood blocks, cymbals, and a clicker (like you use for dog training) for free exploration of sound. As the kids played, teachers would occasionally add in ideas like tone – high notes vs. low notes, volume – if I tap the drum gently, it is quieter – and vibration. We had a large cow bell that if it was on the ground and you tapped it, it barely made sound, if you held it in the palm of your hand, it rang more loudly, if you held it by just barely holding on to the handle with two fingers, then it vibrated a lot and made a long, loud, resonant sound. We’re lucky enough to have two classrooms, so we were able to put this activity in a classroom all by itself so the main classroom didn’t get too loud. Wind instruments – We also had recorders, whistles, harmonicas, kazoos, and whizzers (I don’t know the official name – they’re the party favors that if you blow in them they spin around and make a whirring, whizzing sound.) If you’re home schooling and your kids already share their germs by living together, you could just include these in the baskets for free exploration. In our classroom setting, we didn’t want to share germs amongst 20 kids. So, we do a demo during group time when each child got to blow on one instrument. You could even have them toot a song like Twinkle Twinkle. Telephones: Take a long tube, put a funnel at each end – have kids take turns talking into one end and listening at the other. Or, take 2 plastic cups or yogurt containers – poke holes in bottom, run string between them (tie knots in the ends of the string so they don’t slip through the hole). Kids stand as far apart as they can, take turns talking and listening. What’s that sound? Match the shaker egg. Put a variety of items inside opaque containers (like yogurt containers easter eggs, or cardboard boxes.) Have kids shake them and try to identify what is inside. You can have pictures of the items and they can place each item on its matching picture. Or you can make two of each shaker, and their job is to find the matching shakers. Or you can have one opaque container and one transparent container for each type of object. We used easter eggs and Starbucks snack containers, and filled them with dice, pennies, beads, salt, and little plastic counters. 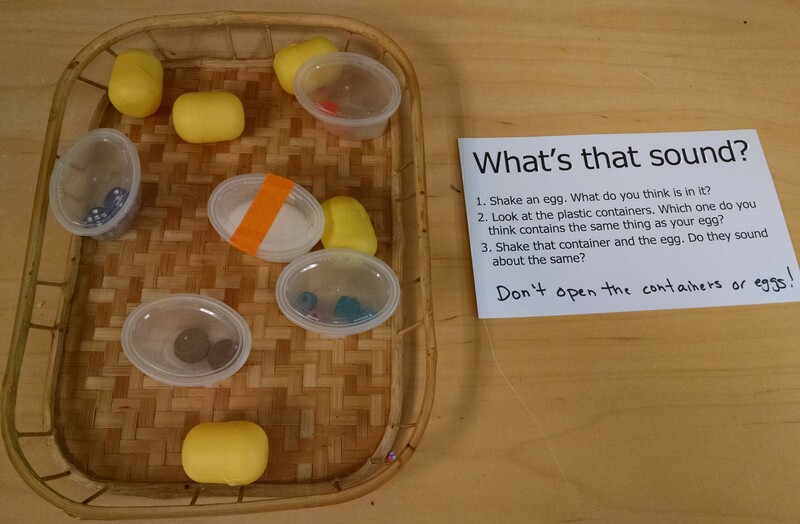 Children would shake an egg, then look at the transparent container and guess which item it is, then try shaking the transparent and opaque container at the same time to see if they match. Craft Stick Harmonicas: I got this idea from Frugal Fun for Boys and there are also full instructions on the Exploratorium’s Science Snacks page. I LOVE this project! It uses standard materials (I sometimes think we should call our class “100 uses for craft sticks, straws, and rubber bands”), is inexpensive, easy to do, satisfying for kids, and surprising to parents in how effective it is. Take a WIDE rubber band, wrap it around a jumbo craft stick from one end to the other. Take a one inch piece of plastic straw, and put it under the rubber band, about a third of the way from one end. Put another craft stick on top of this, and wrap the ends together with a skinny rubber band. Then put another straw on top of that wide rubber band (i.e. between it and craft stick #2) about a third of the way from the other end, and then rubber band the other end together. Put it up to your mouth and blow. (Blow… don’t hum) Here’s a recording of the sound you get from this instrument. Shakers: We have used small plastic containers with lids from the dollar store, or plastic salad dressing size takeout containers, or plastic easter eggs. We’ve used a variety of things to fill them with: salt, popcorn kernels, pasta, jingle bells, elbow macaroni, marbles. Children can choose which to use. (We also had samples set out that they could test before deciding what to put in their own shaker.) They fill, then tape or glue them closed. Then decorate with Sharpies, or stickers. 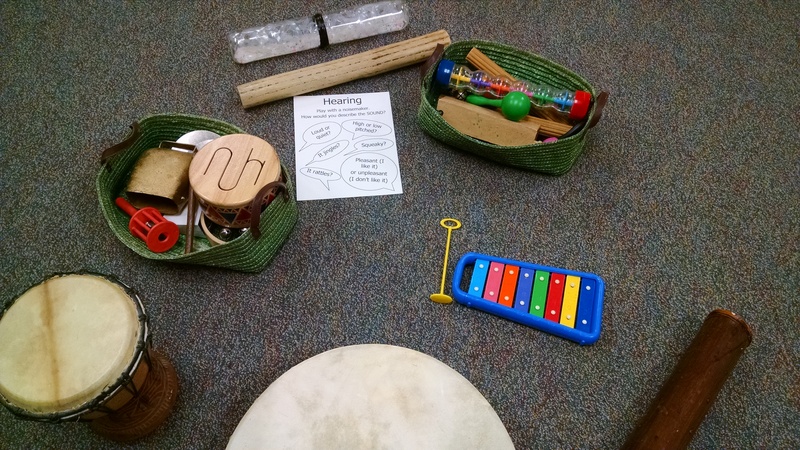 We use these during circle time, along with drumming on plastic (Tupperware-like) containers. A straw whistle. Next year, we’ll try making a whistle with a straw, as described on Allen Centre’s website and Crafts U Print. Or this cool water whistle from Steve Spangler Science. We have many more instruments we could have brought and explored: an accordion, a guitar, and so on. Each has interesting characteristics to discuss. But, if you value your instruments, this may need adult supervision. The teacher beat out a rhythm on a drum or rhythm sticks and asked them to copy the rhythm. We used rhythm sticks, where we called patterns like tap-tap-zoom (tap twice, then rub the flat stick along the ridged stick to make that buzzy sound) or zoom-tap-tap-tap. The teachers offered the first few patterns, then kids suggested them. The teacher would demo it, saying the words out loud. We’d all do it together 3 – 5 times saying the words, then stop saying them out loud and just do the sticks. You could also sing note patterns and ask them to copy. You can blindfold them or have them close their eyes, then make sounds – see if they can identify them. Counting beans: students close eyes. Drop one bean, then two beans in quick succession. Ask how many beans you dropped. Continue with a variety of patterns, up to several beans. Find and repeat the sound: We had adults line up around the sides and back of the room, with the kids in the middle. We then had the kids close their eyes, we pointed to an adult, then all the adults turned their backs and the chosen one made a noise (clapping, stomping, snapping fingers, whistling, humming, tongue clicking). Then the kids opened their eyes and had to guess who had made the noise and how they’d made it, then mimic that sound themselves if they could. Silly sound game: Go around the circle. Ask each child to make a sound with their mouth (whistle, hum, blow a raspberry, click tongue, and so on) or hands (clap, snap, clap legs, etc.) Other children try to copy. This works better with kids 5 and up. What if you couldn’t hear? Talk about the fact that not all people can hear. Teach the word deaf. Ask what things people have invented that help people who can’t hear. (ideas: flashing lights that tell when something is making a noise, hearing aids, closed captions…) Ask how we communicate with someone who can’t hear – write or draw pictures, lipreading, and sign language. Ask if the kids know any signs they can share (many of our students knew a few) and teach a few more. Listening: When we were out on a hike, we listened and described what we heard. Then we practiced deer ears – cup your hands behind your ears and notice how much you can hear. Read more here. Snack time: Have loud foods (carrot sticks, apple slices, tortilla chips, cheerios). What do they sound like when you eat them? Have children cover their ears while chewing – does it sound different? Books: There are LOTS of non-fiction books on the Five Senses, which I cover in a separate post. A couple hearing specific ones are The Listening Walk by Showers where a dad and a child go for a walk in the city to a park and listen for all the sounds along the way. Polar Bear, Polar Bear, What Do You Hear? – great sing-songy, rhyming text for kids to chant along with, where they meet a roaring lion, snorting hippo, hissing snake, and more.